Mamma Mia! is one of the most fun musicals to ever grace a stage, so it only makes sense that Broadway Rose Theatre would include it as one of their productions in its 2018 Season of Irresistible Fun. It’s the ultimate feel-good musical, according to director Lyn Cramer. Much of its popularity has to do with the high-energy pop/dance music of ABBA, written well before the play was even thought of. But much also has to do with the story itself, which is filled with love, tolerance, the foibles of youth, and Girl Power! 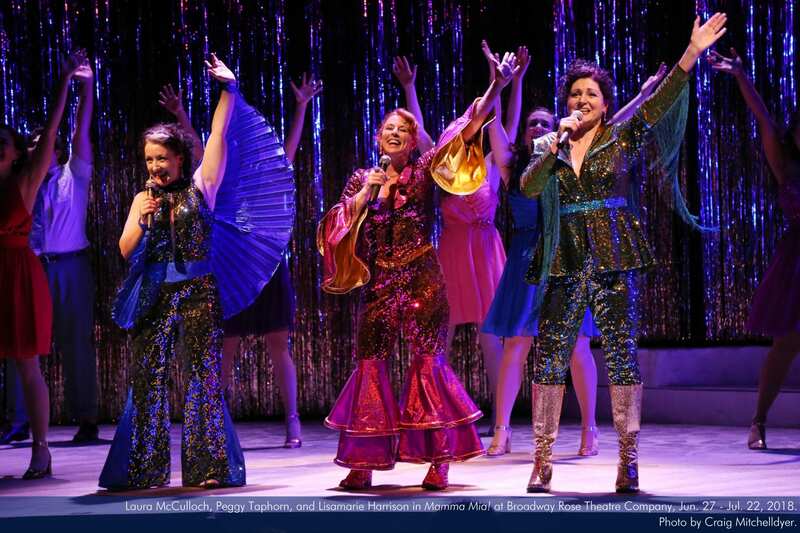 Sophie Moshofsky as Sophie in the Broadway Rose production of Mamma Mia! Photo by Craig Mitchelldyer. The play opens as Sophie (Sophie Moshofsky) and her mother Donna (Peggy Taphorn) prepare Donna’s taverna on a Greek island for Sophie’s wedding. Donna has invited her best pals Tanya (Lisamarie Harrison) and Rosie (Laura McCulloch) to the wedding, and is feeling nostalgic. Back in the day, the three woman comprised a girl band called Donna and the Dynamos. They have quite a few memories to prove it, including, in Donna’s case, Sophie. Sophie, the bride, has invited some guests of her own, and hasn’t told her fiancé Sky (Aaron Stewart) or her mom. In addition to her own gal pals Ali (Shanise Jordan) and Lisa (Jalena Montrond), she has discovered her mom’s old diary, which contains the names of three men. One of them is Sophie’s dad. Donna has never married, and Sophie has never known who her father is. She wants to find out as she takes this great step into marriage. She secretly invites all three and believes that when she sees them in person, she will know which one is her dad. Needless to say, all hell breaks loose when the men show up–Harry (Matthew H. Curl), Bill (Joey Klei), and Sam (Andrew Maldarelli). Donna is horrified, Sky is hurt, and still there is a wedding to put on. Aided by ABBA’s all-time great hits–“Honey, Honey”, “Mamma Mia”, “The Winner Takes It All”, “Lay All Your Love On Me”, “Dancing Queen”, and the rest, this show soars to the top of the musical-comedy genre. Peggy Taphorn as Donna in Mamma Mia! at Broadway Rose. Photo by Craig Mitchelldyer. Mamma Mia! is the brainchild of Judy Craymer, and was written by Catherine Johnson. Music and Lyrics are by Benny Andersson, Bjorn Ulvaeus, and Stig Anderson. The play opened in London’s West End in April, 1999, and since that time has played in 50 countries to an estimated 60 million people. The show is a huge undertaking due to a large cast and ensemble directed and choreographed by Lyn Cramer. Alan D. Lytle directs a 12-piece ensemble, and six pit singers add to the big sound of the ABBA songs. Bryan Boyd has created a beautiful yet simple set on the revolving stage at Tigard High School’s Deb Fennell Auditorium. Allison Dawe’s costumes are perfect. Mamma Mia! can be seen Tuesdays through Sundays at Broadway Rose’s summer home, Deb Fennell Auditorium, 9000 SW Durham Road, Tigard through July 22. It is a superb production and suitable for all ages.